We’re back! Black Lightning is back. Also, La La Gang is mad or something because for some reason he expected the Sparky kids to forget about the abduction and attempted murder. Everything is peaches. Let’s react! Episode info: As the community struggles with the violence surrounding them, a glimmer of hope appears: Is Black Lightning (Cress Williams) back? Lynn Stewart (Christine Adams), noticing the changes in the community, is also left wondering. 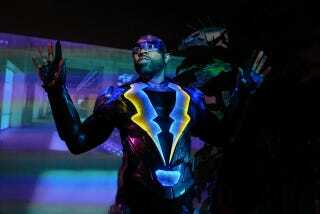 While Jefferson Pierce (Cress Williams) struggles with his decision, Gambi (James Remar) urges him to take up the mantle once more and return to life as Black Lightning. Anissa (Nafessa Williams) and Jennifer (China Anne McClain) try to deal with the aftermath of their jolting experience. Damon Gupton and Marvin Jones III also star. The episode was written by Salim Akil and directed by Oz Scott (#102). I am really excited. I am loving this show. I hope they can keep up and even ramp up the quality even more for the rest of the season. The pilot was pretty damn good.